You've heard that great dental advice — only floss the teeth you want to keep. The same principle applies to print catalogs and products. According to this article in Scientific American, we understand and remember more of what we read on paper than what we read on a screen. Not only that, people want paper because it is a more enjoyable experience. This validation from psychiatrists is not a big surprise, because one reason is already obvious to everyone. When you are online, there are countless distractions. You are checking email, getting notifications, checking the weather, and a dozen other things. It is difficult to focus when you are online. When a customer is looking at your catalog, you have their attention. They are focused on your message, content, artwork, and products. The various elements of your catalog — covers, page headers and footers, ads, and product detail — are all instantly visible to the customer. Your print catalog will accomplish more in one minute than multiple unfocused visits to your site. As noted in the article "Whether they realize it or not, many people approach computers and tablets with a state of mind less conducive to learning than the one they bring to paper." For marketers, what issue is more important than that? This is a risk to be avoided. You have such limited time with your customer. Don't you want to give it your best shot? When you are looking through a print catalog, you flip back and forth between the pages. That makes it much faster to absorb the information. It is fun too, and gives you a kind of control you cannot have online. You can scan ahead, or refer back to something you noticed earlier. And you can easily dog-ear pages, mark it up with highlighters, or scribble notes. This is why most people print out documents when they really want to concentrate on the content. Print is better for long-term "knowing"
One concept that is particularly relevant to marketers is the distinction between "remembering" and "knowing". Remembering is short-term, a recollection of particular facts. Knowing is long-term. When you know something, it takes no time for that knowledge to come to the surface. It is not like remembering, where you have to work hard to get to the same point. Psychologists have determined that reading content on paper helps people "know" the subject much more quickly and thoroughly. 70% of the people who work long hours in front of computers have "computer vision syndrome", according to the American Optometric Association. Computer screens, tablets, and phones shine light into peoples faces, which can cause eyestrain and headaches. One study showed that people who took a test on a computer were more stressed and tired than those who took the same test on paper. As a marketer, the last thing you want is to have your products associated with an unpleasant experience. Be nice to your customers — give them an easy-to-read print catalog. When reading online, people seem to take it less seriously. They scan the text for keywords. They seldom re-read anything. In contrast, print invites people to re-read something multiple times if the information is more difficult to grasp. If the content is in print, it is more likely to be taken seriously. Marketers of technical products must consider this issue. It is fundamental to the buying cycle that the customer have a thorough understanding of the offer, and that they get to that point as quickly as possible. Online materials simply don't cut it. The article states "...people report that when trying to locate a particular piece of written information they often remember where in the text it appeared." That makes sense. If you are trying to remember where you learned about a particular product, it is not hard to visualize where you saw it featured on a particular page of a catalog. You have covers, corners, and many other physical elements to use for orientation. In contrast, it is difficult to visualize a particular product page on the web — it is all a blur. Of course, doing a web search can also help your customer find the product again. But that search could take your customer to one of a thousand wrong places, or even to a competitor's product! According to research noted in the article, one interesting problem with online reading is that it limits the way people can navigate text. 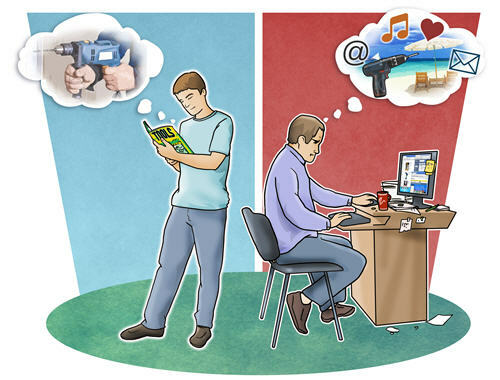 Online devices "inhibit mapping the journey in their minds." With print, you have a sense of a beginning and an end. You know where all the pages are relative to one another. You can feel the pages. There is a rhythm to turning the pages. These physical factors contribute to your memory of the content. In contrast, online reading gives you none of these things. In the case of product information, for example, you can see one or two products on the screen, but you have almost no context. And even that context is gone the moment you click away. That has a negative impact on your ability to remember what you read. While the online experience will continue to improve, the physical nature of print gives it a critical advantage that cannot be matched online. And print technology is improving too. As a medium, it is far more suited to customization than ever before. Not long ago, catalogs were a one-size-fits-all proposition. Soon, custom catalogs will become the norm. If you want your customers to remember and thoroughly understand your products, you had better give them a print catalog.